Attending the 50th anniversary of the Americam Cotton Association, Zhou Xun looked gentle and charming in the clothes which her boyfriend had chose for her. Her face was full of happiness. 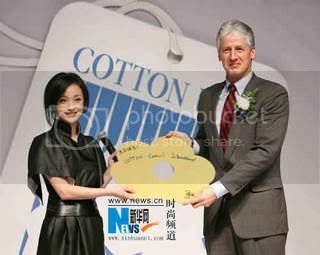 Zhou Xun said that the purified cotton had high quality. For example, her jacket tonight was completely made of cotton.It was soft and made her feel comfortable.